The beauty of choosing a theme for a kid’s party is that everything can be built around that theme. If you keep it simple, for example their favourite TV show, the kids will be excited about it and able to really enjoy the creative spirit of the party. If you plan the party early enough, you’ll be able to take your pick of decorations. You can choose goodies that match the theme for their goodie bags, put streamers and balloons matching the theme’s primary colours around the entertainment area, and you’ll be able to select some really cool (and inexpensive) prizes for all the games that you’ll play! Whether it’s a magician, a fairy, a superhero or just a playlist of music, ensure you choose some entertainment that will suit the theme of the party and surprise your kids. Every kid wants to meet their favourite character aligned to their favourite theme – if Pepper Pig came to visit, they will never forget it! One of the more fun elements of planning a kid’s party is ensuring that the food aligns with the theme. 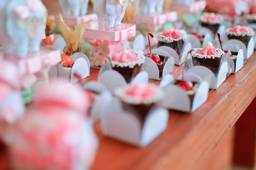 For example, if you’re having a fairy theme, fairy bread and fairy cup cakes are ideal! The cake is the grand-finale, so ensure what you choose gets your kid excited – you can search our directory for cake decorators to assist you. Once you have a theme, choosing the ideal invitation for your kid’s party should be simple. You can find invitations by searching our directory for kids party invitations and stationery. Visit the PartiesandCelebrations directory to find everything you need for theming your kid’s party!